If you have lost all or most of your teeth, you may have also lost the healthy function of your mouth — and your confidence. As your Top Rated Local® dentist in Indianapolis, Lebanon, and Kokomo, we want to help restore your dental health, your smile, and your confidence by providing you with personalized dentures that look and feel like your natural teeth. Contact us today to schedule a complimentary dental consultation with McCall Dentures to improve the health and function of your teeth. Start smiling with confidence again! Experience the Benefits of Dentures! Look, feel, and behave like your natural teeth. Enhance your appearance and restore your smile. Boost your confidence and self-esteem. Reduce facial sagging as a result of full or partial tooth loss. Make eating and drinking easier and more comfortable. Make speaking and communicating easier. Can prevent bone loss while stabilizing adjacent teeth. Can help prevent gum disease. At McCall Dentures, we believe your dental hygiene is of the utmost importance. That’s why we offer a wide range of denture options to help you meet and even exceed your dental goals. Here are the denture services we offer to help you revitalize your dental health and your smile! At McCall Dentures, we want you to have the absolute best dentures available. We proudly handcraft each case with the highest quality materials and strive to give you a look you’ll love and the ability to chew food comfortably. Immediate dentures are delivered the same day as your dental surgery. While they look great and function well, immediate dentures are often used as a temporary cosmetic appliance and are generally replaced by our handcrafted custom dentures following adequate healing time. Our custom dentures are made using the best teeth available and the strongest acrylic on the market. They provide the most natural appearance and look so life-like, no one will know you’re wearing dentures. They are extremely durable and stain resistant. Our wax try-in appointment allows you to see your new smile before it is custom finished to your liking, and any changes can be made. Partial dentures can restore the function and structure of your mouth and jaw by replacing teeth where one or several are missing. Partial dentures restore a more balanced and even bite pressure that can be misaligned as a result of shifting in the mouth due to missing teeth. These removable, natural-looking dentures feel like your own teeth, giving you comfort and confidence when you chew, talk, and smile. We offer several types of partial dentures including cast metal, flexible, and acrylic. 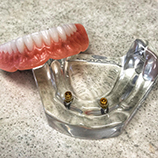 Our cast metal dentures are the strongest option, very lightweight, and offer an outstanding fit. These partials have a metal framework that uses your natural teeth as support. They are extremely durable and should last many years, and chew many steaks! 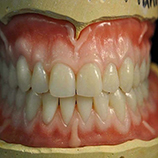 Our flexible partials are made from a gum-colored material and flex much more than the cast metal. They snap over teeth and rest on the gums. These partials are typically used in difficult cosmetic cases where aesthetics are a major concern. Our patients love them! 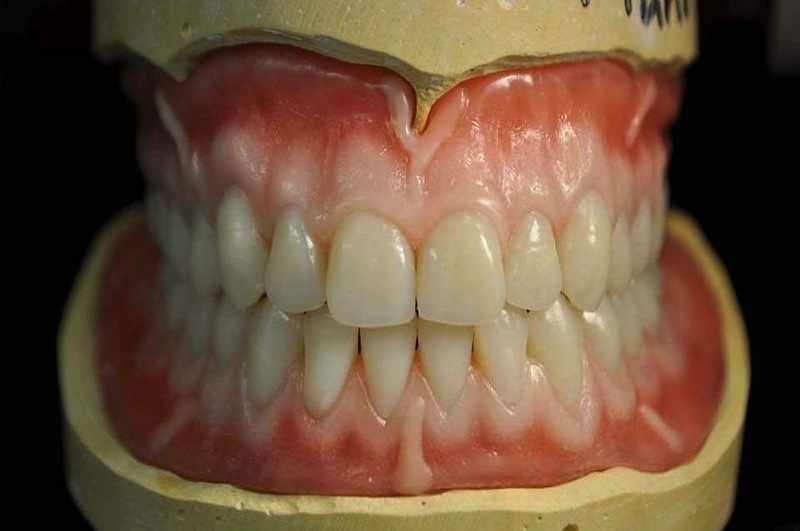 Acrylic partial dentures are less expensive than the flexible and cast metal partials but often tend to feel bulkier. They are a great option for 1-3 missing teeth where aesthetics are a major concern. We typically use them when teeth are removed prior to insertion. 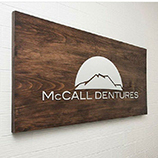 When you want to restore the healthy appearance and function of your teeth and gums and rejuvenate your smile, McCall Dentures is here to help you. Dr. McCall and his team are dedicated to helping you achieve your dental goals with beautiful dentures that look and feel like your own natural teeth. Whether you need full dentures, custom, dentures, partials dentures, and more, we have the best solution for you. Reach out to your Top Rated Local® dentist in Indianapolis, Lebanon, and Kokomo to arrange a dental consultation at an office near you. Restore healthy teeth and a beautiful, confident smile today! Our dentures provide a truly natural appearance, so much so, no one will know you are wearing dentures. We offer options that range from immediate ‘same day’ dentures to full premium sets. For more information, we offer a complementary free consultation. If you've always wanted to eat a steak, bite an apple and enjoy corn on the cob confidently without fear of your dentures slipping or falling out, dental implants may be an excellent option for you -- plus we provide implants right here in the office. With a growing number of offices across Indiana as our patient, you can be assured of quality repairs & hand-made perfection; this meticulous detail can only be offered by a denture specialist. In our blog, we'll show you how we make and fit the dentures and you can see first hand what the McCall difference is.